Casio original technology automatically analyzes the chords in your audio files. The analyzed sound is then displayed as chord chart on the screen. You can also use the app to check the chord positions for the instrument as you play, making it even more fun to play music. You can also play the results of the chord analysis on the instrument pad to check the outcomes. You can then edit the chords yourself as you listen to the actual sounds and write even more accurate chord chart. This is so much quicker and easier than trying to figure out the chords just by listening to them. You can modify the chord chart by choosing a chord from up to three candidate chords that are closest in sound to the analyzed chord. You can also specify the chord manually. Casio original technology analyzes the chords in your audio files.By tapping the instrument pad along with a song, you can experience a virtual performance with the analyzed chords. Even people who’ve never played a musical instrument will find it easy to play along and experience for themselves how much fun playing an instrument can be. * The sound produced when the pad is tapped will be a close match to the mood of the song, but may not be the same chord as that used in the original. You can use your favorite instrument pad to experience virtual playing. When you play using the piano pad or guitar pad, the Guide pane is displayed. A performance evaluation function is also included. After you finish playing, the app displays a radar chart showing the musical genre that most closely matches your playing style. You can also use the recording function to record your performances. Allows you to play the analyzed chords as single tones (black button) or as full chords (white buttons). Assigns one of the analyzed chords to the　individual strings and lets you play it as a chord or as an arpeggio. Lets you play a range of rhythmic patterns in a combination of drums and bass. This feature uses colors to visually show the differences in the sound in the song, based on the analyzed chords. It can also display the accents in a song or the performance history for the piano pad or guitar pad. By using the app to import an audio file into your iPad or iPhone, you can modify the tempo or key of the song. This allows you to enjoy a song in a very different way from the original, such as by slowing down an up-tempo song, or dropping the key of female vocals so that it sounds more like a man. You can also adjust the balance between the vocals and the accompaniment. By playing just the vocals and playing along yourself on the instrument pad, you can discover what it feels like to accompany your favorite singer. The Chordana series apps use original Casio technology to analyze audio files. The apps achieve unprecedented success in extracting natural chords from the time changes and the distribution of　frequency components included in audio waveforms, while also taking into account the characteristics of the harmonies, melodies and rhythm instruments included in the song. The crew at Positive grid have been at it again, working their iOS app magic on a revolutionary new amp simulator style app for guitarists, bass players, and shredders alike. And keep an eye out right here for a full review soon! JamUp Pro discount and comp. If you’re yet to sample the virtual guitar amp app JamUp Pro from Positive Grid, now is the perfect time with a sweet 25% off the regular price. It offers fantastic sounds, plus some other great features including a Phrase Sampler, adjustable pitch/time music player, and multitrack recorder (via in-app purchase). Positive Grid are also currently running a competition via their website/Facebook page. To be in the running to win an Apogee JAM ($99.99) and $25 iTunes gift card, simply post a ‘creative’ photo of you with JamUp on their Facebook or Twitter feed. Comp runs until mid November. IK Multimedia – the global leader in mobile music-creation apps and accessories – is proud to announce thatiRig® BlueBoard, a groundbreaking new wireless MIDI pedalboard for iPhone, iPad, iPod touch and Mac, which gives guitarists, bassists, vocalists and keyboard players hands-free wireless control of mobile and Mac music apps, is now available from musical instrument and electronics retailers worldwide. iRig BlueBoard is the first wireless MIDI pedalboard for iPhone, iPad, iPod touch and Mac that uses Bluetooth technology to transmit MIDI messages to control app and software functions and features. Musicians can use iRig BlueBoard to control parameters in their favourite music making apps – such as stompbox effects on/off, preset patch-switching on the fly, volume or wah control, or any other MIDI controllable function. Set-up is as simple as turning on the power and launching the iRig BlueBoard companion app and assigning the backlit pads to the desired control function. 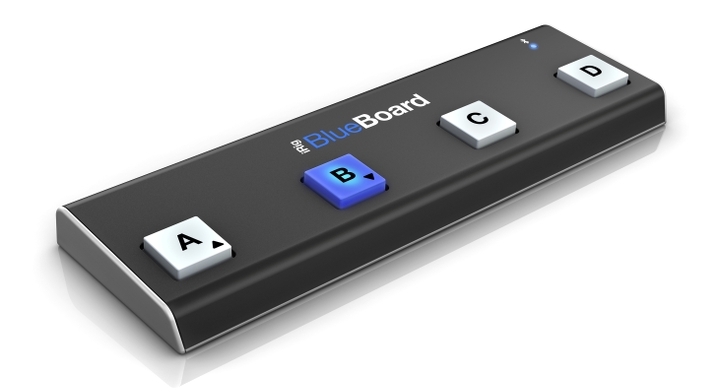 iRig BlueBoard uses Bluetooth 4.0 (LE – Low Energy) technology to transmit the actions of its four onboard, backlit footswitches and its two optional external devices to the mobile device or Mac. Then, using the iRig BlueBoard app (download from the App StoreSM) and software (download from the IK web site User Area), the Bluetooth signals are converted into MIDI messages and routed internally to the music app that’s running on the device. Any music app or Mac music-software application that is MIDI compatible (the standard communication protocol for musical instruments) – such as IK’sAmpliTube, VocaLive, SampleTank, iLectric Piano, iGrand Piano – or any other Core-MIDI-compatible app like Apple’s GarageBand, can be controlled wirelessly. iRig BlueBoard is also expandable – musicians can add up to two standard additional expression pedals or footswitches via the unit’s two TRS 1/4″ expansion jacks, allowing for control of continuous rotary functions like wah effects, volume, EQ, gain control, etc.For a guitarist or vocalist using a mobile multi-FX app like AmpliTube or VocaLive as a sound processor, iRig BlueBoard provides the foot-controlled functionality and convenience of a pedalboard, but with a form factor so compact and portable that it can easily slide into a backpack, a laptop bag or an instrument case. 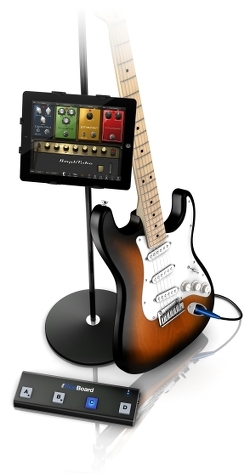 The fact that iRig BlueBoard uses wireless Bluetooth leaves all the wired ports of the device free, so they can be used simultaneously by interfaces or controllers that feature the 30-pin or Lightning connector, like IK’s iRig PRO,iRig HD, iRig MIDI or iRig KEYS, and adapters or microphones that use the device mini-jack such as iRig, iRig PRE or iRig Mic. Moo Cow Music have been quiet for awhile, and now I know why! They’ve been working on this comprehesive band-in-a-box music production app! Looks very interesting indeed. Ever wanted a recording studio in the palm of your hand? Looptical is a complete music production solution for iPhone and iPod touch. – Play keys with a single or dual 128 key keyboard layout, complete with pitch/mod wheel. – Use the Scale Keyboard to play scales effortlessly by sliding a finger up and down the screen. – Strum your way through your own palette of chords with the Chord Guitar. – Use the Latched Arpeggiator to turn simple chords into sequences of notes. – Use Quantize to tidy up your performance, and Undo any mistakes. – Songwriting in Looptical involves creating Loops: building blocks for a song that could be a one bar bassline, an 8 bar chorus, or a 100 bar indulgent guitar solo. – Use the Loop Bank to combine, merge, repeat, and insert these Loops to form larger riffs, and ultimately a complete song. – Use the Event List to perform mass edits of notes, such as tweaking velocity, quantize or transpose. – Add and mix up to 24 stereo tracks with Looptical’s Mixer. – Add up to 5 Insert effects (Overdrive, Bit Crusher, Compressor, EQ, Filter, Chorus/Flanger, Phaser, Trance Gate, Delay) to each track, and a single Reverb Send effect. – All mixer and effect parameters are automated and changes are recorded directly into the song. – Record vocals with the iPhone internal microphone or compatible audio interface and add your own effects with live monitoring. – Control input with an intuitive preamp-style gain and noise gate. – Record audio tracks directly from any Inter-App Audio (iOS7) Instrument app. – Use Audiobus (requires purchase from third party) to send and receive live audio to other Audiobus-enabled apps. – If the 95 keyboard and 50 drum presets (including 600 individual drum hits) are not enough, create your own from scratch. – Import samples via iTunes Shared Folder, from another iPhone music app via the clipboard, or resample the current song. – Effortlessly create an entire new instrument from a single sample, or add further samples for a multi-sampled instrument. – Edit your sample to trim, chop, loop, amplify, fade or reverse sections. – Export your instrument to use again, or even share with others via the Looptical forum. – Plug in an iPhone-compatible MIDI keyboard and you can break out of the iPhone screen and compose using a full hardware piano keyboard. – Play drum parts by assigning piano keys to each pad, or effortlessly noodle a solo by playing the Scale Piano from the major keys. – Assign spare MIDI controllers such as Pan or Modulation to directly control automation parameters in Looptical insert effects. 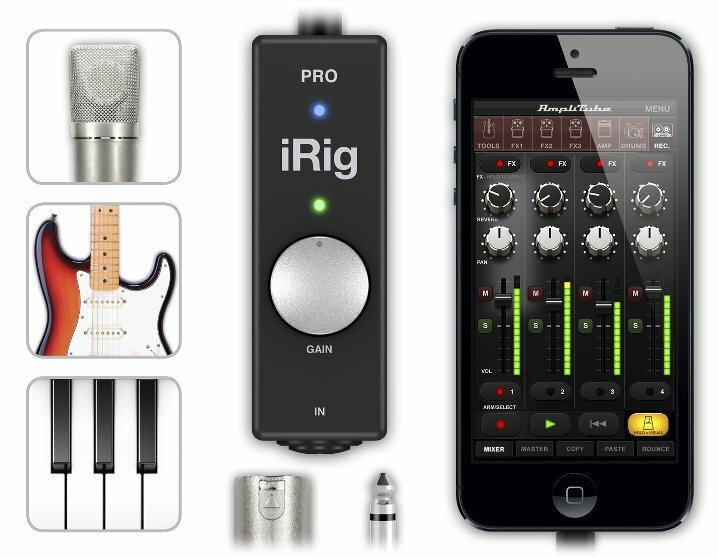 Plus, iRig PRO comes with a suite of IK’s best music-creation apps such as AmpliTube, VocaLive, SampleTank, iGrand and iRig Recorder, and is compatible with most audio and MIDI processing apps for the mobile musician. Mac users will also enjoy the inclusion of premium software with iRig PRO, like AmpliTube, T-RackS and SampleTank, and will appreciate the unit’s compatibility with any type of music-creation software. Designed for guitar, bass, or violin players who need to play a realistic woodwind instrument sound for recording or live performance, with natural fretless vibrato and note bends, iFretless Sax is a more believable sax replacement than keyboard-controlled synths.